I have missed the earlier debut It’s Time to Face the Doomsday by Italian Children of Technology, but after listening to their EP Mayhemic Speed Anarchy I knew that their music would be something I would want to sample again. And now with Future Decay there is an opportunity to delve into their havoc and debauchery one more time. The opening title track sets it all up perfectly. Piano notes dropped amidst disturbing synth background and drums of doom create the atmosphere of Mad Max wasteland movies, leading the way to where the Italians really want to go, punk infused Motorhead inspired thrash. Manly thick guitar tones, tubed out solo, pulsating bass, Deathlord Astwulf’s lower voice with some strategically placed screams, gang vocals yelling “Future Decay” – the title track rocks. It is not always that the album’s title track is its best one, but on Future Decay that is certainly the case. The rest of the way Children of Technology seemingly reach for the same heights, but do not always capitalize. Everything seems to be on their side, the chosen names, the makeup, the moniker which would allow incorporating some techno elements if they wished to do so, the cheap horror movie atmosphere they just created, but the rest of Future Decay seems to be below the mark the title track established. Some songs (Remembrance Day, Hold Up Your Fuel ) are breakneck and chaotic, but then they lack the special element of the title track leading up to the explosion. Opening up the B side Eaten Dust Overload is almost macho Sodom-like Germanic thrash, the punk feel almost entirely missing. Last Sunshine Gleaming and Fear the Mohawk Reaper finally throw caution to the wind, come out with more tempo and vocal squeals, and then it all ends too soon. 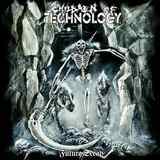 So, paradoxically, while brimming with punk potential atop their thrash foundation, Children of Technology did not provide enough of that punk attitude, the aforementioned havoc and debauchery I was looking for. Future Decay seemingly hits the marks, but rarely swings for the fences.